Senator John McCain (R-AZ) has prided himself as being someone who can deliver "straight talk," who is unafraid to tell it like it really is. But depositions from a forthcoming legal challenge to the McCain-Feingold campaign finance reform law should make us wonder if the Senator and his supporters are shooting straight or giving us double talk. Here's the deal so far. Floyd Abrams is a noted attorney specializing in First Amendment cases who is challenging the new McCain-Feingold law on behalf of Senator Mitch McConnell (R-KY), a defender of the current campaign finance system. 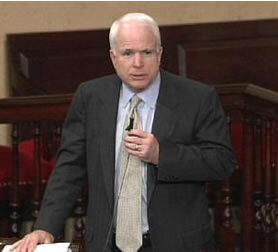 He was able to take depositions from McCain twice this fall. As reported by Arizona Republic writer Billy House, Abrams had repeatedly urged McCain to detail the senators -- regardless of party -- who have violated criminal or ethical laws by accepting contributions and then performing specific favors for the donors. The best McCain could muster in response was this: "The purpose of campaign finance reform was to eliminate the widespread belief that there is the appearance of corruption in Washington, D.C. And the appearance is there...It is not my job to identify that from a legal standpoint." Under pressure from Abrams, McCain did charge that Sen. McConnell had said to GOP senators in 1998 that they should not worry about opposing legislation hiking cigarette taxes because the tobacco companies would stand by their friends by making campaign contributions. What shocked McCain was that such a statement came just before a vote rather than "whether the tobacco companies did it or not." McCain repeated the story when his second deposition was being taken, but conceded under questioning by Abrams that he had never looked to see what Senators had then been on the receiving end of post-vote campaign contributions from the tobacco companies. Even though he had been telling that story to constituents with great effect. As McConnell points out, the charge is an old one and that he, unlike McCain during the Keating Five scandal, has never been the target of an investigation by the Senate Ethics Committee. Furthermore, adding my own two cents, does anybody really believe that Senators would let their vote be influenced by the possibility of pocketing tobacco money, when it is an easy loser in the public opinion polls? But by McCain's own standards, if he and his allies want to find somebody who let the Senate down by committing one of his "appearance of corruption" acts, then he should look in the mirror. Right as his 2000 presidential campaign was taking off, McCain wrote letters on behalf of an independent TV chain to the Federal Election Commission inquiring about the status of a proposed TV station and license sale in Pittsburgh. At the time the letters were written, McCain had chaired the Senate committee that regulates the FCC. The good Senator from Arizona also pocketed campaign contributions in the thousands of dollars from the chain's magnate and his family and associates. He also used the magnate's jet at a rate significantly below what his campaign would have paid had it chartered its flights. In his defense, McCain has said he never, ever pressured the FCC for a specific decision. But he also admitted that what he did "could possibly be an appearance of corruption." Now, Fred Werthheimer, a noted campaign finance reform advocate, appears all too willing not to address questions about McCain's answers as taken during the depositions, while continuing to insist the whole campaign finance system needs revamping. Campaign finance reform advocates have been playing a game of 'gotcha' for years, trying to argue that contributions `buy' votes in Congress. They are unable to grasp the fact that usually the votes are cast because the politician believes in the cause -- be it that of organized labor, business, the environment or pro-life -- and takes his stand accordingly. The money goes to him because he shares that belief; it does not buy his belief. There is plenty of real waste, mismanagement, and fraud in the government that needs to be rooted out. If McCain was a real workhorse instead of a showhorse, then he should be going after that in the manner that Senator Charles Grassley did when pursuing Pentagon waste. But it's easier for Senator McCain to make vague charges about the "appearance of corruption" against the entire Congress rather than finding real instances of real corruption in the government that is costing people real tax money. In Senator McCain's case, his perception is not the reality of what is really happening in Washington. Paul M. Weyrich is CEO and Chairman of the Free Congress Foundation.